The head of Reliance Industries, Mukesh Ambani became the richest person on Forbes' 'India Rich List 2017', yet again. He has been sitting on this position for 10 years in a row. Ambani's net worth right now is Rs 2.5 lakh crore ($38 billion). His younger brother, Anil Ambani stands far behind in the list on 45th spot with $3.15 billion. 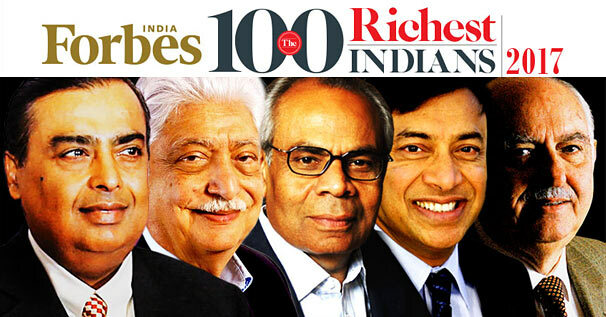 Ambani is closely followed by Azim Premji, who is heading Wipro with the net worth of $10 billion. According to Forbes, Modi's "economic experiments" barely affected India's billionaires. Yet, the most surprising spot on this list goes to Patanjali Ayurved's Acharya Balkrishna. Acharya made a huge jump from 48th place last year to 19th right now. His net worth is $6.55 billion (about Rs. 43,000 crores). 51. Jain Family $3 Bennett Coleman & Co.